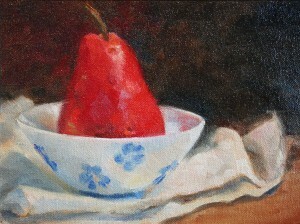 The making of a pear. Every so often I like to take a break and relax in the studio. Stop worrying about series and concepts, and just paint. I’ve been spinning out some little studies of fruit, inspired by the amazing variety and beauty of the produce at our local farmer’s markets. 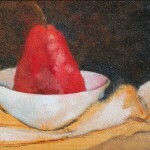 Red Pear, December, oil on canvas, 6″x8″. Posted in art | Comments Off on The making of a pear. 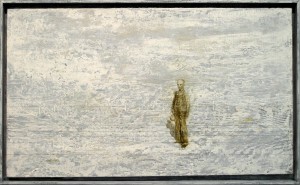 Artist Trust has selected my painting Dry Farm for their benefit auction on February 20th. 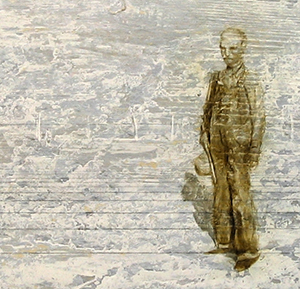 I am delighted to support them: Artist Trust is a wonderful nonprofit which supports Washington state artists directly with informational resources, biz education workshops, and grants.